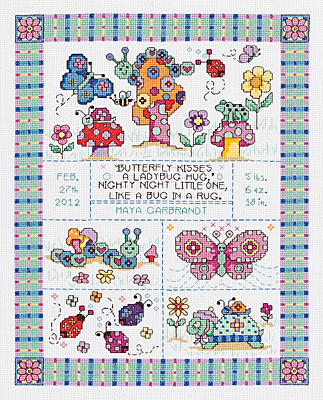 Add a touch of whimsy to baby’s room with the addition of “Bug in a Rug,” a new counted cross stitch design by Sandy Garbrandt. The colorful piece will surely complement most any décor, and the area for personalization makes it a thoughtful gift. Design size: 9.75" x 12.75". Kit includes: 14-count cotton Aida fabric, 6 strand carded 100% cotton floss, needle, graph and multi-lingual instructions. Made in the USA by Janlynn.